Jaisalmer: An MiG 27 fighter aircraft crashed on Tuesday evening in Rajasthan's Jaisalmer. The pilot of the fighter jet managed to eject safely. According to the officials, the crash took place near Pokharan range at around 6:10 pm after the plane took off for a training mission from the Jaisalmer air force station. A court of inquiry will investigate the cause of the accident. 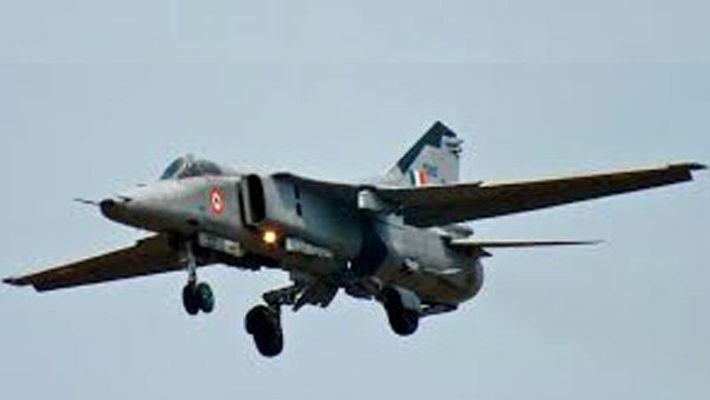 The crash took place just a few days ahead of Vayushakti 2019 exercise where MiG-27 will showcase its ground attack capabilities on February 16 at Pokhran Air to Ground Armament range near Jaisalmer. The upgraded MiG-27 is a very potent air-to-ground strike aircraft, which is capable of carrying a variety of armament comprising bombs, rockets and front guns. This aircraft can operate over a wide range of speeds due to its swing-wing design. Last year, an MiG 27 aircraft had crashed in Jodhpur, also in Rajasthan. The MiG-27 jet is a Soviet Union-designed fighter aircraft and is among the several fighter jets that the Indian Air Force operates. The Indian Air Force also operates the MiG 21 and the MiG 29.